Even a democratically elected president of the European Commission, or the elimination of the circus that is a European Parliament based in two cities, will not make citizens fall in love with the Union. Maciej Kuziemski interviews Jan Zielonka, who says that what’s required is a form of European integration able to meet the needs of societies put under pressure by current geopolitical tensions and the digital revolution. Maciej Kuziemski: Today’s European Union is riddled with tensions and has diverged far from the ideals and ambitious aims that lay at its foundation. Multiple external circumstances and the pressure exerted by them could have had an integrating effect, but the opposite happened: today, the Union is on the brink of collapse and its leaders lack ideas for real solutions. Jan Zielonka: I believe there are three scenarios for the possible disintegration of the European Union. One is that everything will collapse due to external shock, and European leaders will be unable to take control of the situation. The second scenario involves an attempt at reforming the Union in a way that is so disastrous that it will lead to its demise. I call this the Gorbachev scenario, but we might as well compare it, for instance, to the Habsburg Empire, the fall of which was also accelerated by certain reforms. In the third version, I can imagine a Union that exists formally, but has stopped fulfilling its functions – it becomes an empty shell unable to solve problems important to its citizens. These three scenarios are still current – first of all, we observe how the shock caused by the immigration wave has shaken the foundation of the Union, and we do not know if it will recuperate from this. Previous turbulences were caused by the economic crisis of the Eurozone, which was never permanently solved, but only superficially patched up. In fact, the attempt to respond to migration and financial pressure divided the EU members instead of uniting them. Moreover, it did so without solving the problems. Will Greece pay its debts? Have any of the summits devoted to refugee issues resulted in any solutions? Today, the proper partner for effective action in Europe is still Angela Merkel, and not Jean-Claude Juncker or Donald Tusk. The third scenario – slow dwindling of position – is occurring right before our eyes. The Union is already in the process of disintegration, but no one wants to openly admit this. The question is when the next shock will occur and whether it will be sufficiently strong to destroy the Union. There is no point speculating, because the nature of shocks is that they occur unexpectedly. Everyone knew that the world economy was in crisis and that the Euro was not adapted to surviving strong economic blows, but “to know” and “to know” are two different things. Your description suggests the leaders of nation-states have a very cynical approach to the Union. Maybe the problem lies in the deficiency of mass trust in the European institutions that stems from their extreme inefficiency: in critical situations the telephones start ringing in Berlin, not in Brussels. It was like this throughout the entire history of the integration, but I think that the situation is far more severe: the integration model we opted for assumes a monopoly for nation-states, legitimised not in the European sphere, but in the national sphere. The lack of general European democratic legitimisation has its limitations: it functions well when the winds are favourable, but it does not work when legitimisation needs to be built based upon participation or choice. Why? Because the nation-states realise the interests of their voters. Even though Angela Merkel is truly pro-European, she answers only for the German voter. All the decisions she made in the last years, even if they factored in European interests, represented first and foremost German interests. The problem is the disproportion of power of different nation states that violates the equality procedures created by the EU: when the Greeks rejected the reform package suggested by the Union, the German minister Schäuble replied that the voice of Greek voters is of no interest to him when there is German money at stake. On the other hand, the countries that voice the need for reforming the Union most decisively, like the UK, do not want to deepen integration and do not consider democratising the Union through elections and through civil participation a good solution – rather the opposite. Do we have to accept that the Union must undergo some sort of fragmentation and become a community of isolated multi-level interests instead of values? I see the United Kingdom as a pathological example. On the one hand, it claims that the monetary cooperation system should be federalised, but, on the other, the UK will not belong to it. It is easy to have opinions on others’ business. There are two camps in the referendum debate: one claims that the Union is the symbol of all “evil” and has to be abandoned in favour of the nation-state. The other camp says: let’s stay because we are outside any significant area of integration anyway. I consider this approach pathological. However, it is true the Union should be reformed. But the reforms proposed by Cameron were designed to deal with his own internal problems – not even British interests, but the interests of the Conservative Party. It seems more and more obvious that the Union is structurally incapable of undertaking any serious reform. Small reforms do not change anything and large ones are controversial. One institutional trick will not change a complicated system. The elimination of the circus that is the functioning of the European Parliament in two cities, or choosing the president of the European Commission in general elections, will not make the citizens fall in love with the Union. Our situation is like in the joke: we can turn the fish tank into fish soup, but we cannot turn fish soup into a fish tank. I fear the European Union has become fish soup and we must integrate Europe from anew. Interestingly, the Union enjoys greater sympathy and acceptance among Poles than among the citizens of any other nation. Maybe there is some correlation between the amount of funds Brussels keeps pumping into Poland. In such a utilitarian sense, integration remains fruitful for Central Europe. This will probably end when the source dries out around the year 2020; however, wise leaders should think in a longer perspective than the budget cycle or the next elections. Given the Union’s impotency, can it still be a guarantor of peace and prosperity? I do not want to deny the merits of the Union in stabilising European democracy, but it is not the only factor, nor even the most important one at play in the economic success of the EU. If it were so, how would it be possible for Poland to develop well at the same time that, for instance, Latvia and Hungary are in crisis? The Union is not to be credited for all our successes, but is also not to be blamed for all of the “evil” that we encounter. The Union as an international integration system has little to do with the crisis of capitalism and democracy with which we are still struggling. Public opinion polls on trust towards other nations show that the younger the generation, the less will there is to cooperate and the weaker the sense of solidarity and responsibility for other Europeans. Do reasons for this lie in a radically different historical experience, without the Berlin Wall and a divided Europe, or in the growing feeling of insecurity connected with the job market, the lack of inter-generation solidarity, of which the emanation is the fact that the generation entering the job market today cannot count on the same social security and state care that were available to their parents? My explanation as to why the younger generation is different than the older one is not only different historical experience, but also different from/in material experience. Today’s youth belong to the digital generation. This revolution gained momentum only about a decade ago, changing communication and the feeling of social solidarity. In the digital world, the church, family, and school – institutions that used to control the formation of youth – have lost their significance. Communication has become highly pluralised, and the possibilities of manipulating value systems have become narrower. Today, people mobilise for a particular issue, not for an ideologically coherent package of issues. You can organise a protest, mobilise masses through social networks without leaders, achieve certain results and disperse. The world of politics does not keep up with the digital revolution, remaining stuck in the twentieth-century paradigm, in which communication with citizens does not occur directly, but through traditional institutions that were supposed to organise life and control society. Today’s politics does account for the fact that the internet has taken down the limits of communications, changing permanently the functioning of capitalism, democracy, and integration. Let us examine the example of the recent discussion in Poland on military issues: I read that Poland plans to adopt a territorial defence act that might as well have been written at the end of the 19th century – firstly, due to a completely archaic idea of how wars are conducted in today’s world, and secondly, because of its disregard for the scale of social changes. How many Polish youth will put on uniforms to fight for their fatherland? Probably fewer than in the old days. And anyway, contemporary war requires computer specialists instead of boys marching in uniforms. The economy naturally has to keep up with changes, because it lives off of it, while the world of politics is not keen to adapt. I will venture the thesis that the European Union is a postmodern alliance that has not modernised rapidly enough to answer the challenges of the present world. I fully agree. Within the last thirty years, three immense revolutions have occurred, shaking the pillars of state power – and the Union is an organisation of states. The geopolitical revolution, the economic revolution, and the digital revolution. It suffices to examine how the Union offices use the internet: as if it were an instrument of propaganda. Instead of trying to create tools for moderating social dialog and bringing the Union closer to its citizens, it showers them with unreadable documents or over-enthusiastic tweets. The last few decades have confirmed that inside the Union we do not have common interests, even when it comes to defence. The Italians care for Ukraine as much as the Poles do for Libya. Moreover, we do not have a system that could translate our general principles to community solidarity. The Union is not only not a state, but it also does not have a common demos, or a mechanism for building common interests. What emerges from your description is a grim image of a patchwork in which the denominator of common interests is low and the available instruments are incomplete and faulty. Politics is about solving conflicts. Societies are always divided. When we speak of the Union, we speak of the division between nation-states, because they control and create it. But nation-states are also not uniform. Even Poland, which has so few ethnic minorities, is divided between inhabitants of cities and of the countryside, or between people who would wish for separation of church and state, and people who want the state to realise their religious norms. The role of politics is to conduct a continuous tender for a common definition of interests, which are not given once and for all in democracy. The European Union does not have a mechanism for doing this. Exactly. One example of how the Union did not adapt to changes is how states have monopolies over integration, and mega-cities, which generate 80% – 90% income, are excluded. Cities organise mass events – they are one of the largest entities organising public security. Cities like London, Paris or Berlin have a key role in immigrant and refugee issues. Despite this, they are absent at the Union decision-making table, at which places are held for fallen states like Greece or Cyprus, or tiny states like Latvia or Malta. The same applies to international corporations, which have broken completely free from state control. Non-governmental organisations – the intermediaries in the global discourse on ethics – are also absent from the discussion. And hence, the persuasion that this EU world is limiting its own scope of influence. Today, in order to be effective, you have to navigate three scenes: first, the global theatre, where the actors are mainly markets, and the criterion of effectiveness is profit. Then there are the nation-states, a very provincial theatre with local actors, where the decisions are legitimised democratically, unlike in the global theatre. And between the two there is the EU, which does not have an immediate influence; neither over profits, nor over the legitimisation of the system. And we must come to terms with this. 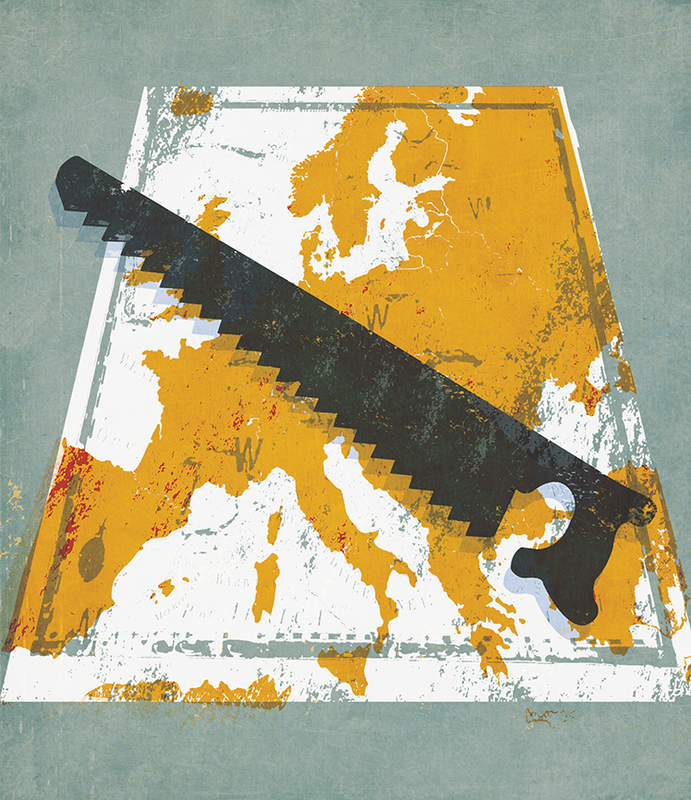 The European Union today inhibits integration, instead of enabling it. For people who are as European as I am, this is frustrating. Meanwhile, criticising the Union is erroneously perceived as an expression of xenophobia and backward nationalism. I believe that if we are true Europeans, we must say: we want to integrate, but in a way that is adequate to reality. The role of politicians is to help solve this impasse, and if they do not do this, they should be replaced. This article was originally published in Visegrad Insight “Allied Solidarity” vol. 1(9)/2016.